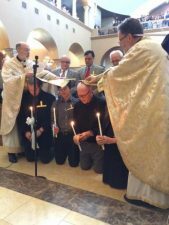 CRN has reported on Hank’s conversion to Eastern Orthodoxy since the news broke in April. You can follow the story here. Family members of Dr. Walter Martin, founder of the Christian Research Institute, are calling on current CRI president Hank Hanegraaff to step down due to his conversion from evangelicalism to Eastern Orthodoxy. A majority of the family members have signed a statement asking the “Bible Answer Man” to leave his leadership post. Jill Martin Rische, the eldest daughter of Dr. Martin and who leads Walter Martin Ministries alongside her husband, Kevin Rische, told The Christian Post in a phone interview on Thursday that she and many other evangelical Christians were “shocked an [sic] surprised” when Hanegraaff was formally received into the Eastern Orthodox Church back in April.